Thermally sprayed stainless steels are selected based on a number of variables including corrosion resistance, high temperature resistance and mechanical properties. 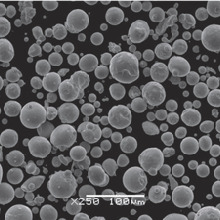 Alloy stocks stainless steel powder and wire in many grades, configurations and particle sizes which can be specifically formulated to be sprayed utilizing all thermal spray techniques including plasma, flame spray, HVOF and arc spray processes. Our stainless steel alloys are sourced globally from all the major suppliers, including our own brand of specially manufactured alloys, METALLURGICA.